Bob Herman at We Heal Computers is professional yet personable. A tech guy that you can communicate with. Most importantly he was able to help my small business cost effectively. Would definitely recommend using these folks! Just wanted to say thanks We Heal Computers team for catching that virus before it affected my network. Great work! As a small business owner, it is always hard to find good IT assistance. 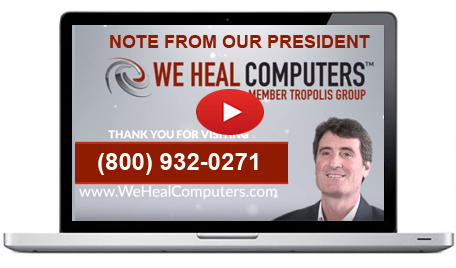 We have used We Heal Computers successfully on a number of occasions such as virus removal, setting up remote access, and advising us on the most suitable laptops for our accounting business. Bob is very knowledgeable and professional and I would highly recommend him for any business owners! Thank you We Heal Computers for providing fast and courteous support. I now have peace of mind about my network. maintenance, dashboard w/remote access to your computers, reporting, and access to Help Desk. Need support for Servers or more than 20 computers? No problem! Contact us today for a custom plan. Select the number of computers.